Sometimes I feel like I don't have enough tools around to teach Levi about colors, numbers, shapes, etc. I wanted to buy or make something that he could use to play and learn that I could adjust as he advances. That's why a felt board is great, because you can continually cut out new shapes! I had a little helper...just hanging out eating his granola bar in the middle of the poster board. 1.) You may want to first iron the large piece of felt if it has wrinkles like mine did. 2.) Lay felt flat on the floor, then lay the poster board on top of it. 3.) Cut around the board, leaving about two inches on each side to glue to it. 4.) Cut excess fabric away from corners, creating a square (see below). 5.) Glue each edge to the board using the felt glue. Make sure it's pretty tight. 6.) Attach sticky Velcro pieces to the highest places on the back of the board. 7.) Connect the Velcro to it's matching piece, leaving the sticky side exposed on the back, so you can just place it on the wall without worrying about sticking them exactly where the corresponding Velcro pieces are on the board. Make sense? I don't think I worded that well. 8.) Stick the board to the wall. 9.) 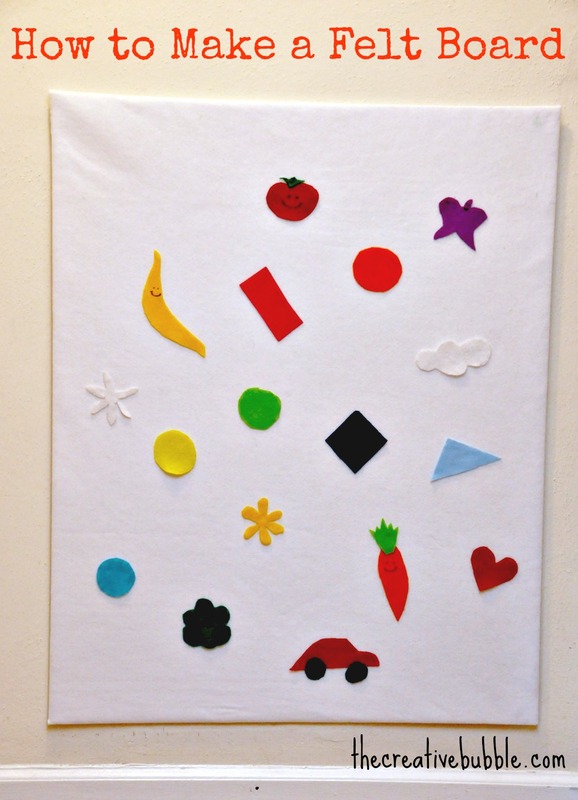 Cut out shapes to stick to the felt board. I love this part! Felt sticks to felt in case you didn't know. Levi loves his new felt board! So far I have just cut out some quick and easy shapes to fill the board, but there are so many possibilities with this thing!! You can really find some cute ideas if you search for felt boards online. I am looking forward to making shapes for each holiday. Be prepared to have felt pieces scattered throughout the house if your toddler is anything like mine! I'd love to hear if you make or have made a felt board, and what shapes you come up with for learning/playing. I just used a sharpie pen to draw the faces on the banana, tomato, and carrot. Hi,great idea, this is quite new for me! The felt shape sticks itself on that board? Love it!